Or is it a jawbreaker? It's been an odd week. While visiting family in California, the left side of my jaw swelled up from an abscessed tooth, and even though I was in an area bursting with people and stores and traffic and everything, the only dentist I could reach was more than 2,000 miles away in the remote area I fondly call home. Yes, luckily, that was my dentist. Actually one of the office workers handled it all for me - office workers do make it happen - and soon I was popping the prescribed antibiotics and ibuprofen and slowly feeling better. But, once back home, said dentist said I needed a root canal and now here I sit, post procedure, with a completely numb left side of my head. Also, the cat got skunked. Lightly. But. Nonetheless. And the water heater's on strike. 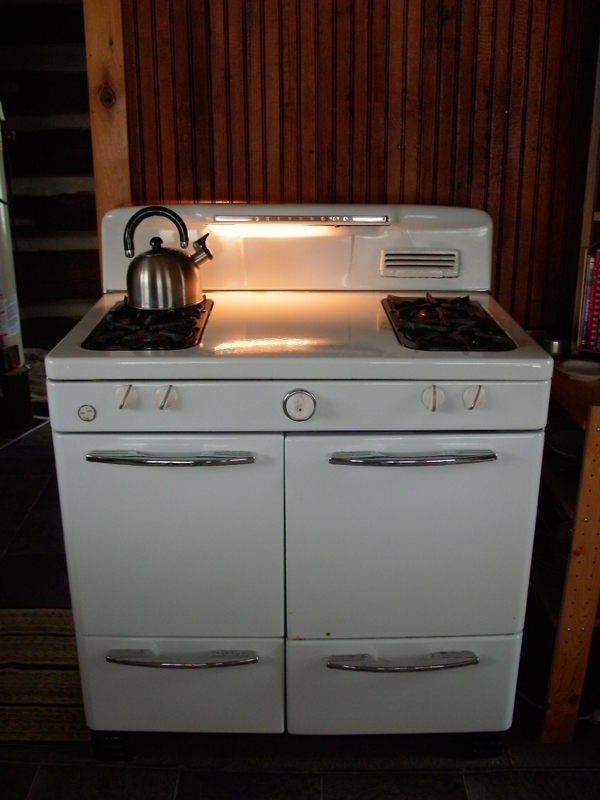 My old stove. Nothing a little vinegar couldn't cure. I slept on an increasingly hard and lumpy futon sofabed in the cabin's main room, a room that was filled with flies and wasps during the day and mice and bats at night. (OK, there was only one bat. But he sure got around.) Most of my stuff, or what remained of it after various sales and give-aways, went into the garage until I could find storage space inside. Until I could finally construct at least one closet. It was kind of chaotic, moving piecemeal in the van, finding a place to shower, not knowing when or if the house I had sold would actually sell and give me the money I needed for so many things, like a well, for water. But then it was also quite peaceful, bathing in the river, washing my hair in the rain, dreaming of a bathtub filled with bubbles and hot, hot water. And I had chosen it, the cabin, over all other options, and if mice, flies, wasps, a lumpy bed, a FEMA hassle, showering on the fly, and one bat flying around inside on a full moon night while coyotes howled outside came with it, well, so be it. Not that I was really so nonchalant about it all at the time. 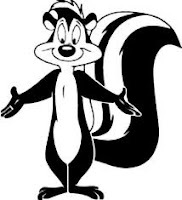 A year ago I didn't have a skunky cat. Or an abscessed tooth. 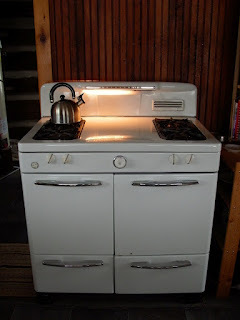 I did, though, have an old water heater sitting dusty and unused in a corner of what would become my bathroom in a far-fetched, far-flung cabin. Maybe the water heater would work. Maybe it wouldn't. Or maybe, as it turned out, it would work for a little while and then, once again, I'd try something new. 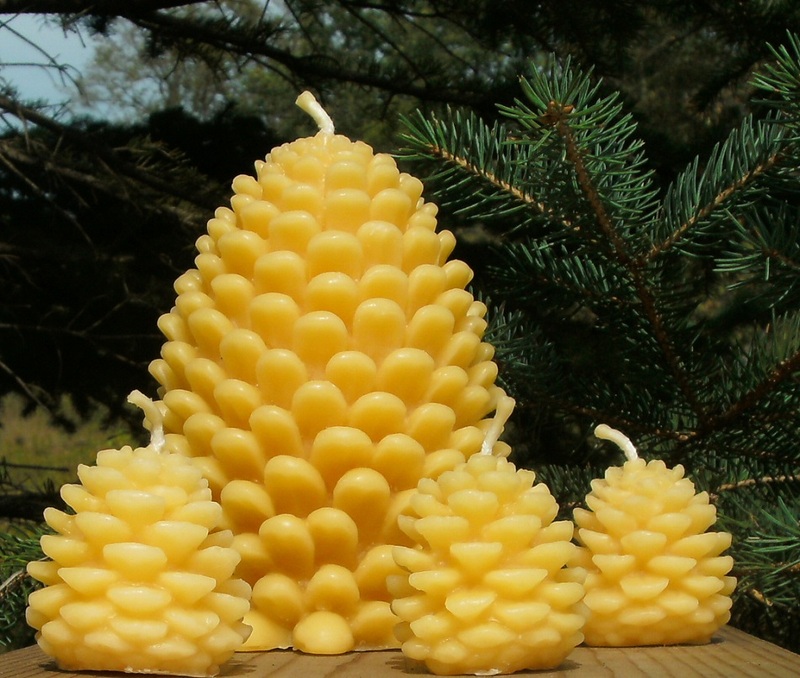 Set of four beeswax pine cones.